With expectations at an all-time high, is Isaiah Thomas the Nuggets missing piece? After starting for almost all of his nine-year career, will a move to the bench re-ignite Isaiah Thomas’ career? If Thomas does buy into his bench role, is the Sixth Man of the Year award a real possibility for the two-time All-Star? After signing a one-year deal worth $2 million with the Denver Nuggets this offseason, Thomas projects to be the teams backup point guard behind Jamal Murray putting him in prime position to grab the award for the best bench player in the National Basketball Association. Thomas provides the Nuggets bench unit instant offense with his ability to score from anywhere on the court and make his teammates around him better. His pedigree is certainly as a scorer, but Thomas also averages 5.1 assists per game over his career and does a solid job facilitating to the rest of his teammates. Thomas’ ability to play with the ball in his hands and get his teammates involved brings a dynamic to the Nuggets second unit that is needed with Will Barton sliding into a starting role. Running with the second unit allows Thomas to feast on the opponents backup point guard, which puts Thomas in an even more advantageous situation when he is on the court. Thomas instantly will be the go-to scorer off the bench, and if there’s one thing Thomas has proven at all his stops along his career, it is that he can score the basketball. What also bodes well for Thomas is how the rules for sixth man of the year are put into place. In order to be in the running for the award you have to start under 25 games, which shouldn’t be a problem for Thomas with him slated to be the Nuggets backup. So, as long as the Nuggets stay fairly healthy, Thomas shouldn’t start in all but a couple games next season. Reigning sixth man of the year winner Lou Williams came close last season starting in 19 games, and will most likely be Thomas’ greatest competition for the award next season. All signs point to Thomas being handed the keys to the kingdom with the Nuggets second unit, and it’ll be up too him to run it to perfection. With a career offensive rating of 115, Thomas ranks 18th amongst active players in that category. After posting a career high 28.9 points per game with the Celtics in 2016-17, the Nuggets are hoping the MVP caliber version of Thomas returns next season. Of the 473 games Thomas has played professionally, 324 have come as a starter. That means that being a bench guard is going to take some getting used to for him after years of leading starting offenses. In order to prove himself once again, Thomas has to accept his role as the backup point guard behind Murray. Accepting his role could come easier than expected for Thomas considering the respect and relationship he already has with Nuggets head coach Michael Malone. During the one season Thomas played under Malone, he averaged 20.3 points and 6.3 assists. That season sparked Thomas’ career and it is what ultimately led him back to playing under the coach who helped jumpstart his career. With 25 games of playoff experience under his belt, Thomas comes in as a veteran on this Nuggets roster. As the Nuggets second-oldest player at 28 (Millsap, 33), Thomas isn’t just the star of the Nuggets second unit, but he’s also considered a veteran leader on one of the NBA’s youngest teams. Still, Thomas has high expectations and expects the Nuggets to be a playoff team next season. “Be a playoff team,” Thomas said of his aspirations. “That’s the goal. They were one game from the playoffs [last year]. I’m just there to help, in any way I can possibly help. I know [head coach] Mike Malone trusts who I am, as a player and a person, and he’s going to give me the opportunity, and I’m going to take advantage of it,” said Thomas in an interview with Tim Bontemps of the Washington Post. Since Thomas moved on from the Kings, he’s appeared in the playoffs three times and finished the 2016-17 season fifth in MVP voting. 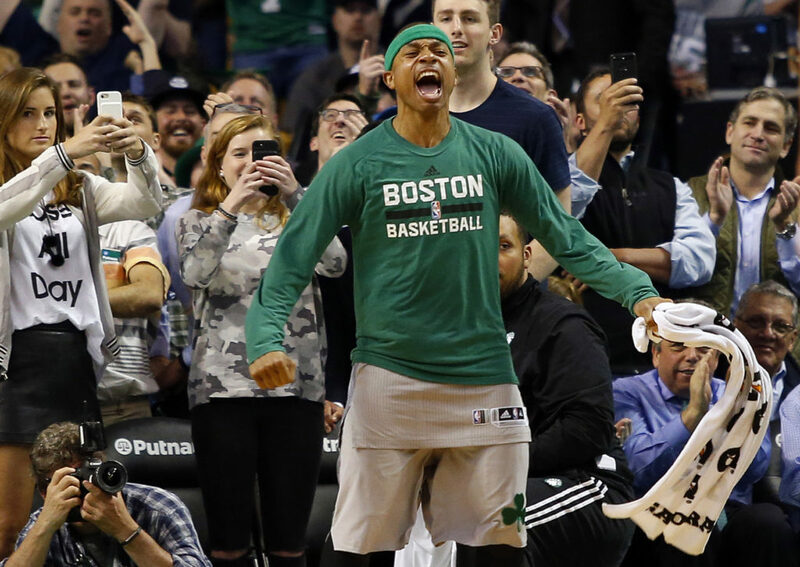 All three of Thomas’ playoff appearances came with the Celtics with the most memorable coming during his MVP-caliber season. Thomas averaged 23.3 points during 15 playoff games and led the Celtics to the Eastern Conference finals where they were ousted by LeBron James and the Cavaliers. Sixth man of the year or not, Thomas checks off all the boxes the Nuggets are looking for in a backup point guard. Dynamic scorer to run the second unit? Check. Has the ability close games and come up big in huge situations? Check. Comes in with a chip on his shoulder and something to prove? Check. So to answer the question from earlier, could Thomas be the Nuggets missing piece and is the sixth man of the year a real possibility for two time all-star?